A Photograph: Trees. Fitzgerald Marine Reserve. 1994. The Fitzgerald Reserve Trees photograph was made in March 1994 as part of the experimentation with the hand-built prototype BetterLight Scanning back (a digital insert replacing sheet film) for 4x5 view cameras. 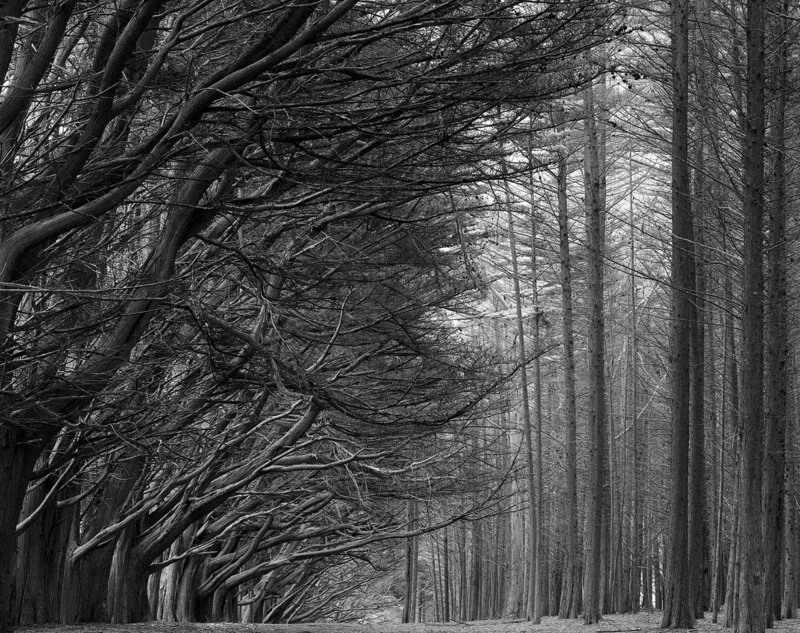 These trees are in Moss Beach California at the Fitzgerald Marine Reserve between Half Moon Bay and San Francisco. This image is an infrared exposure, with only the red channel of the RGB photographic file used. It was raining at the time we made the photograph which forced us to protect the camera and computer with the view camera dark-cloth. This image was the first photograph I made with the 4x5 digital scanning back that I felt was a strong image. This tree stand was likely planted in the late 19th century by German immigrant Juergen Wienke who built his Moss Beach Hotel nearby on the property. A few more details: This is the first serious photograph I made with the prototype digital scanning camera by inventor Michael Collette. Made with Prototype 2 in March 1994, with Mike in attendance, this black and white infrared was made in low light and gentle rain. This was a breakthrough image for me, as it was the first successful photograph I made with camera, prompting me to start showing friends and colleagues, cementing the idea that this ambitious national parks project I had dreamed up might actually be viable. In that sense, this image changed photographic history for me. 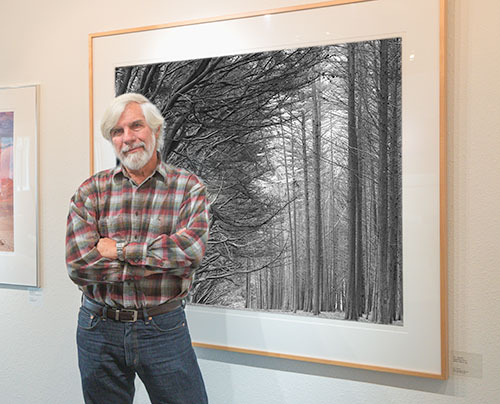 The trees at the Fitzgerald Reserve in Moss Beach California became a dramatic demonstration of the quality of the BetterLight Digital scanning insert that I had been testing with its inventor Michael Collette since he first showed it to me in September 1993. Michael and I had been going out with his hand-built prototype, testing the insert, since January 1994 when we went around San Francisco comparing its image quality to 4 x 5 color, black-and-white film of various film speed and granularity. Before the Fitzgerald reserve trees photograph, I had only made photographs that felt like technical explorations of this new technology’s capabilities. It was a very real limitation with one hand-built camera and the time that Mike could spare to go out. By the time we visited the Fitzgerald Reserve with its wonderful stand of cypress trees along the top ridge line I was emotionally ready to try very hard to make a strong image. What came out of the photographic experience was more than I could've hoped for. The photograph I made that day in March of 1994, has become an icon in my own photographic history, and for some, a turning point in history of photography. The BetterLight scanning back allowed me to out-resolve film, see the image as I was making it, mold its interpretation of the scene on site and understand the finished photograph as an image while I was standing in front of the camera. This was a major paradigm shift in photography, to be able to experience the photograph as you're making it, when you can still make alternative decisions and improve the image to be a more faithful interpretation of the scene you are witnessing, and that inspired you to make the Image to begin with. Of course, in this particular instance, there were challenges. It was starting to rain and getting dark. We decided to photograph in infrared for the added sensitivity and with the light falling fast, it ended up being a 20 minute scan. With all of the hand-built and Macintosh and Scanning Camera electronics before us, the increasing rain was a problem. The black view camera dark cloth became our rain shelter as we worked. Photographers often make use of every available resource to improvise their way through situations that they don't anticipate ahead of time. The dark cloth was a perfect example of that. Steve at the Make Software Photoshop Exhibit. "Digital Photography: Equip with the Best." IdN, Vol.3/No.3. 1996. Hong Kong. 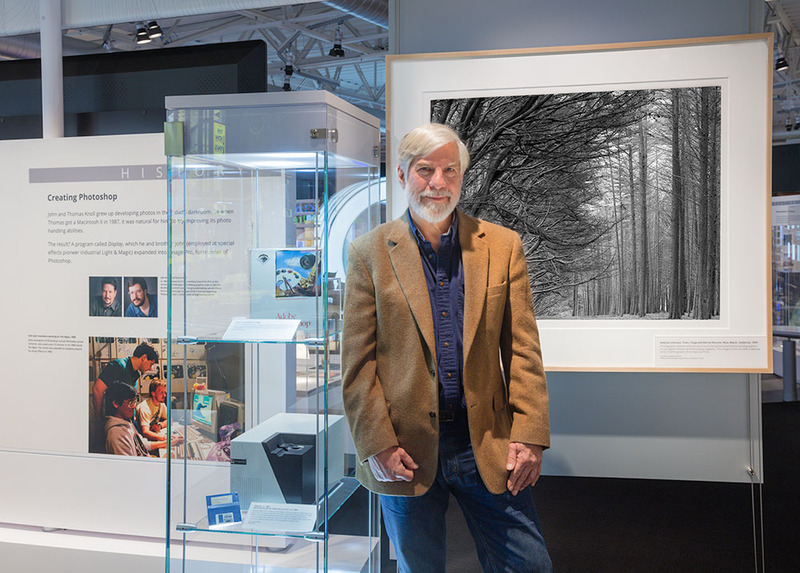 "Stephen Johnson: A Photographic Pioneer in the Digital Realm." Communication Arts, August 1994, Palo Alto. "New Eye on the World." Adobe Magazine (cover story), January/February 1995, Seattle. On exhibit in the Make Software Photoshop Exhibition at the Computer History Museum. Mountain View, CA. Prints are in the collection of the Oakland Museum of California, the Computer History Museum and many private collections.